Computed Axial Tomograhy ( CT or CAT scan) is a way of looking inside your body using a special camera. The images produced are cross-sectional, like the slices in a loaf of bread. During a CT exam the scanner takes multiple "slice" pictures of you. These pictures are created with the help of a computer and are capable of depicting various internal body parts in much greater detail than standard x-ray films. This greatly enhances the doctor's ability to diagnose a medical condition. The CT scanner contains a large donut-shaped ring that your body slowly passes through on a moveable table. As you pass through the ring, the scanner takes a complete 360 degree picture of you that is sent to its computer. Then the mechanical table moves a small distance - less than half an inch - positioning you for the next picture. These pictures can then be reconstructed by the computer to form a complete image of your internal anatomy. To make a clearer picture of certain parts of your body, some CT scans require the use of contrast materials, which are substances showing up as pure white on the x-ray. Two types of contrast materials used include an oral contrast (swallowed) and intravenous contrast (given through a vein in the arm). The type of contrast necessary depends upon the exam that you have been required to receive by your referring doctor. You may be given one or both types of contract, or in some cases no contrast at all may be given. 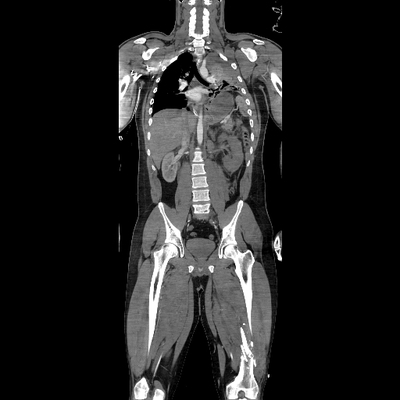 HOW DO I PEPARE FOR A CT SCAN? You should wear comfortable, loose-fitting clothing to your exam. You may be given a gown to wear during the procedure. Metal objects can affect the image, so avoid clothing with zippers and snaps. You may be asked to remove hairpins, jewelry, eyeglasses, hearing aids and any removable dental work that could obscure the images. You may be asked not to eat or drink anything for several hours beforehand, especially if a contrast material will be used in your exam. You should inform your physician of all medications you are taking and if you have any allergies. If you have a known allergy to contrast material, or “dye,” your doctor may prescribe medications to reduce the risk of an allergic reaction. Also inform your doctor of any recent illnesses or other medical conditions and whether you have a history of heart disease, asthma, diabetes, kidney disease or thyroid problems. Any of these conditions may increase the risk of an unusual adverse effect. IS THERE ANYTHING SPECIAL I NEED TO KNOW ABOUT A CT SCAN? FASTING for two hours prior to the procedure. No food or drink. The following CT Scans with IV contrast do NOT require fasting prior to your procedure. I'VE BEEN REFERRED FOR A CTA SCAN...WHAT IS A CTA SCAN? A CTA scan or Computed Tomography Angiography is an examination that uses x-rays to visualize blood flow in arterial and venous vessels throughout the body, from arteries serving the brain to those bringing blood to the lungs, kidneys, arms and legs. CTA is a patient friendly procedure. Contrast material is injected into a small peripheral vein by using a small needle or catheter. This type of exam has been used to screen large numbers of individuals for arterial disease. After the test most patients are able to return to normal activities immediately following the scan. Your exam will be read and a report will be phoned, faxed, or mailed to your physician promptly. He or she will share the results with you. DO YOU DO HEALTH SCREENINGS? Yes. Medical problems cannot be treated unless they are first identified which is why we offer Health screenings that are vital to preventative care. We know that many people undergo anxiety and apprehensions when undergoing medical procedures which is why we want you to know what to expect before your screening, and your results will be delivered as quickly as possible. Preventative screening by CT is a procedure that normally takes between 5 to 25 minutes and can accurately identify abnormalities and signs of disease that would nor otherwise be visible. We provide the following preventative health screening services, which may be performed alone or in any combination. CT LUNG SCREENING: Lung cancer when detected in earlier stages can be surgically removed. CT ABDOMEN SCREENING: Used to detect unsuspected abnormalities of liver, kidney, gall bladder, or adrenal glands. CT PELVIC SCREENING: Typically is performed to evaluate for possible abnormalities of the bowel, ovaries, prostate gland, or bladder which can be asymptomatic. We can work with insurance companies if coverage is extended for screening. Patients should understand that many insurance companies do not offer reimbursement for these examinations. It is for this reason that it is recommended that patients have a physician referral to schedule these tests which are performed without IV or oral contrast. Results will be sent to their physicians. Test results may be inconclusive at times and in some instances require additional tests. Our center does not recommend screening as substitutes for more comprehensive examinations or studies. PREVENTION AND EARLY DETECTION ARE FUNDAMENTAL TO FINDING DISEASE EARLY, SO SCHEDULE YOUR PREVENTATIVE SCREENINGS AS SOON AS POSSIBLE.